On 15 July 1930 a block of peat was cut out of Dagsmosse mire and put into a wooden box with a nailed on lid. Apart from the date (in fact two dates occur on the box 15/7-30 and 30/6-30), archaeologists also wrote on the box ‘special finds’ and ‘decorated vessel fragment’ together with information about the excavation square, C9, and the find number, find 1. The box measured 25 x 25 x 12 cm. 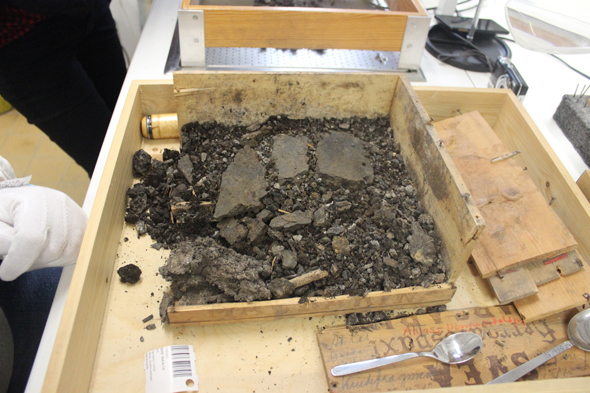 During his work on Otto Frödin’s excavations Hans Browall was not able to excavate this block (Browall 2011, p. 25) so it remained in the storerooms of the Swedish History Museum under accession number SHM 19414. On 19 January 2016 the team of the Alvastra project (Alvastra pile dwelling – an archaeological resource) decided to excavate it. 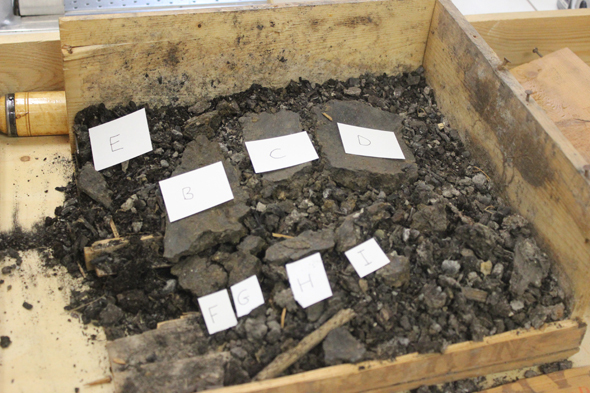 Our curiosity was originally provoked by the reconstructed vessel (Browall 2011, p. 264) from the same square as this peat block. This vessel is without a bottom. The ceramic assemblage from the pile dwelling contains very few remains of vessel bottoms and so in our striving to understand the ceramics of Mats Malmer’s excavations we wanted to see what the bottom of these vessels looked like. We suspected that this block might help us in this striving. The block was removed from its wooden box. It was investigated in three different layers. Layer 1 consisted of two lumps of peat which lay side by side on the top of the block surrounded by loose soil (fig. 1). 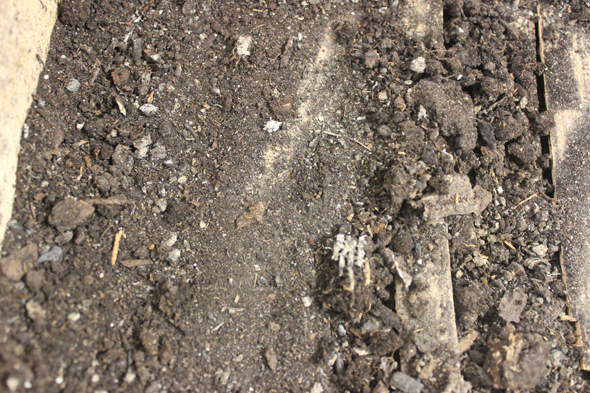 The loose soil was removed and dry-sieved (0,5 cm mesh size used throughout). The peat in the two lumps was completely dry and it was possible to lift them off the block. They were removed. The lumps were sprayed with water and subsequently soaked in water for a few hours. It was then possible to break up the lumps and sieve the soil. 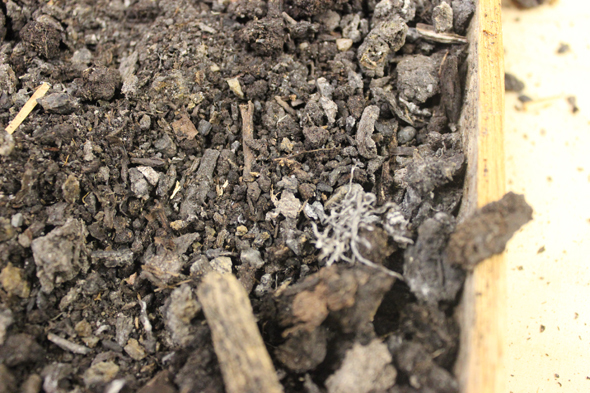 The soil contained some charcoal, some wooden chips, small sticks and plant remains from the peat. These were not collected. The only finds collected were a small splitter of flint found in the sieve and find 1A, a pottery sherd which fell out of the block as soon as the box was dismantled. Layer 2 was the layer which contained most of the large pottery sherds in situ (1B – 1I; figs 2 and 3). They were immediately visible when the lumps of dry peat were removed. Fig. 3. In-situ potsherds with numbering used in database (Accession number 19414:C9, F1B-I). Photo: Nathalie Dimc, SHM. Three pottery sherds were stuck to the underside of the two lumps (Find 1L and 1M in one lump and 1N in the other). Fig. 4. The underside of one lump of dried peat with negative impression of potsherd 1L and potsherd 1M still attached to the soil. Photo: Nathalie Dimc, SHM. Further sherds of pottery were collected from the peat around the in-situ sherds 1B-I in the two different halves of the block area (1K and 1J). Layer 3 The in-situ sherds were removed and the peat under them was examined. 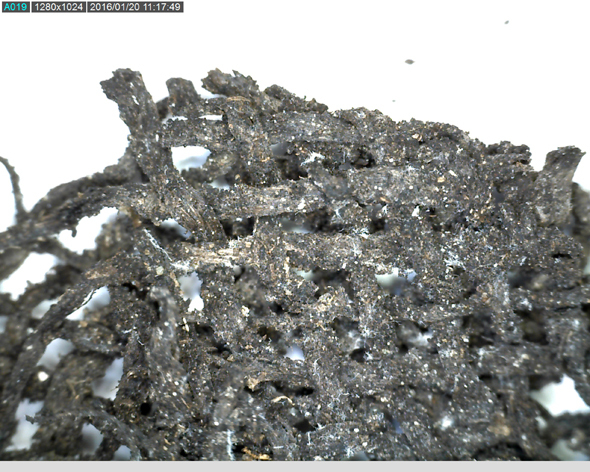 Three textile fragments were observed in the peat (fig 5 and 6). Two could be recovered in tact (fig. 6 and 7) whereas the third (fig. 5) fell apart during the process of removal. The layer consisted otherwise of loose soil which was poured into the sieves. Hazelnut shells, burnt and unburnt bone fragments and a further two potsherds were recovered from the sieves. Fig. 5. Textile fragment in layer 3. Accession number 19414:C9, F1Å. Photo: Nathalie Dimc, SHM. Fig. 6. Textile fragment in layer 3. Accession number 19414:C9, F1Z. Photo: Nathalie Dimc, SHM. Fig. 7. Magnified picture of textile fragment. Accession number 19414:F1Y. Photo: Helen Persson, SHM. 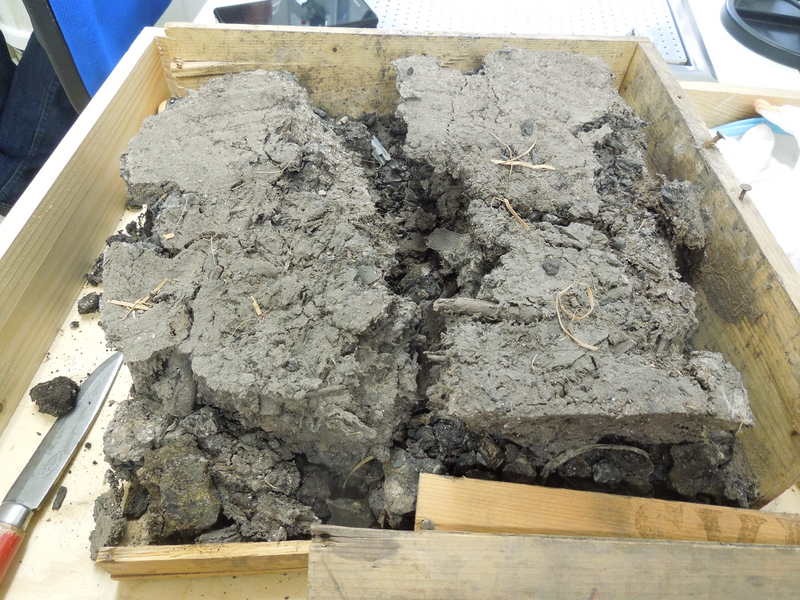 The block of peat did not contain the vessel bottoms that we had hoped for. Instead the pottery sherds were parts of the rim and body of pottery vessels. An analysis of the pottery recovered will feature in the next blog post in this series. 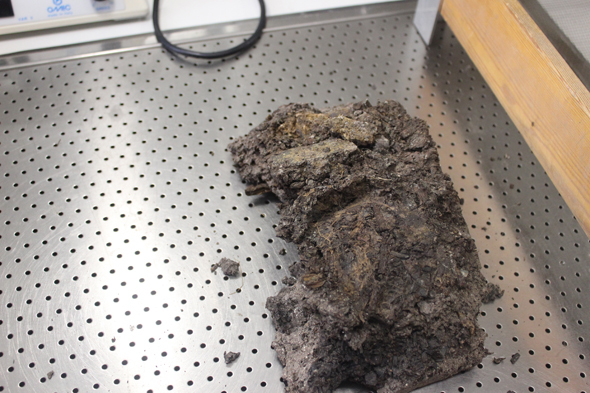 Three fragments of woven textiles were discovered at the bottom of the peat block. These would indeed be very important findings if they proved to be contemporary with the potsherds. No other woven textiles are known from Stone Age contexts in Sweden. The textile fragment should be stratigraphically older than or as old as the potsherds but the cutting of the peat block in 1930 must be seen as an intrusive episode which may have disturbed the stratigraphy in some way. In future blog posts we will investigate these textiles and explore their context more thoroughly. Participants in excavation: Nathalie Dimc, Jackie Taffinder, Greg Tanner (members of the Alvastra project), Hilde Skogstad (conservator, SHM). Helen Persson, textile specialist at the Swedish History Museum, has taken a short look at the textile fragments discovered. Figur 1 ser ut som lerhaltig jord! Det ser inte ut som torv. Mycket spännande i den kontexten. Kasta inte! Skölj inte bort! Fyndet kanske är själva jorden! Thank you for your interest. I can assure you that it is peat and not clay. We still have the remains from sieving and would be very glad to show you whenever you have time. Very exiting! Perhaps you have already seen it, but I want to point your attention to a small piece of textile found in Malmö, Petersborg in the 1990s. It is debated whether it is woven or not, but the dating is clear, and it is Early Neolithic I! If you want I can send you the report. I don't have it digitally, so please send me your address, and I'll post a paper copy. Thank you very much for this very interesting information. I am sorry to say that I haven't seen this find of a very early textile fragment. I would very much like to have the report. Will send my address by mail. Here is the reference to the Early Neolithic textile fragment that Åsa Berggren told me about: Siech., S., Berggren, Å., 2002. Öresundsförbindelsen. Petersborg 6. Rapport över arkeologisk slutundersökning. Rapport nr 15. Malmö kulturmiljö. Malmö. I have a copy kindly sent to me by Åsa.